We’d love your help. 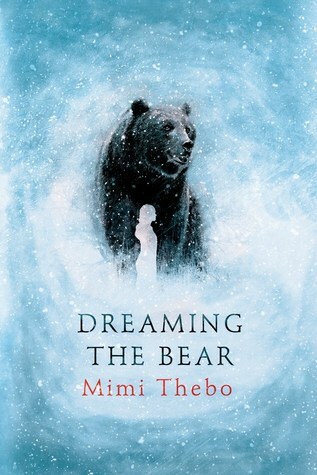 Let us know what’s wrong with this preview of Dreaming the Bear by Mimi Thebo. Darcy’s dad, a naturalist, moves their family from England to the snowy wilderness of Yellowstone National Park. Mum, Dad, and older brother Jem are all thriving, but Darcy misses her friends, and civilization, including WiFi. She’s also sick, getting weaker with each day, and having strange dreams—or are they something else? Then she finds an injured mother bear whose cubs Darcy’s dad, a naturalist, moves their family from England to the snowy wilderness of Yellowstone National Park. Mum, Dad, and older brother Jem are all thriving, but Darcy misses her friends, and civilization, including WiFi. She’s also sick, getting weaker with each day, and having strange dreams—or are they something else? To ask other readers questions about Dreaming the Bear, please sign up. A beautiful and unique animal story from Mimi Thebo. Darcy is a young girl who has recently suffered pneumonia and is recovering in her parents' cabin in Yellowstone Park when she meets an injured bear. One thing that particularly stood out for me about this book was the depiction of Darcy's illness - as a chronically ill person I'm always on the lookout for books that do this well. You could really feel Darcy's limitations and I liked how she related to the sick bear. A great book, and nice to se A beautiful and unique animal story from Mimi Thebo. Darcy is a young girl who has recently suffered pneumonia and is recovering in her parents' cabin in Yellowstone Park when she meets an injured bear. Darcy isn't happy with her parents. They have dragged her away from her nice English town and stranded her out in the wilderness near Yellowstone Park so her mother can study bears. Darcy is recovering from pneumonia and is very weak. She's supposed to go hiking outside to build up her strength, but not get wet. At one point, she finds an injured bear in a cave and starts to feed the bear, who becomes very close to her. There is a horrible blizzard while her mother is away doing work, and Darcy, her father, her brother Jem and Jem's cute friend Tony hunker down in the cabin for almost a week while the mother flies back to England to visit, since she can't get home. Eventually, the bear becomes ill, Darcy is found out, and things get ugly. Strengths: I loved the descriptions of being snowed in and of living in a desolate area. No internet! Modern children would be very confused! Weaknesses: This had a rather disjointed style, and I was confused by the bits with the bear sometimes. A solid, well-plotted novella which considers the idea of home, identity and family through the eyes of a British girl transplanted to Yellowstone park (against her wishes) where her father is employed. The bond between bear and girl is beautifully realised and serves as a contrast to her more complicated human relationships. Unusual & interesting. Transporting, poetic, rooted in the earth yet utterly magical. I loved this book. And it made me long for the wild. • Many ways the book could have gone - it did not necessarily go the most interesting and imaginative way. Again, this doesn’t mean I didn’t like the ending, explanation and resolution it did choose. In two minds. Interesting, but something is lacking. I picked up Dreaming the Bear at the library because it has a beautiful cover (just look at that majestic bear in that majestic blizzard), and the description made it sound pretty interesting. I wasn't sure I'd be super into it, and I was a bit wary after the first page or two because first person present tense is something I am pretty iffy on. Ultimately, I fell in love. While the book has its flaws, I honestly feel willing and able to disregard them all. First off, the main character is a teena I picked up Dreaming the Bear at the library because it has a beautiful cover (just look at that majestic bear in that majestic blizzard), and the description made it sound pretty interesting. I wasn't sure I'd be super into it, and I was a bit wary after the first page or two because first person present tense is something I am pretty iffy on. Ultimately, I fell in love. While the book has its flaws, I honestly feel willing and able to disregard them all. First off, the main character is a teenage girl with serious health problems. We watch Darcy struggle with her health throughout the story. We watch her struggle to do things that are simple, or at least should be for someone her age. This shook me. I feel like it's important to note here that I am a young woman with health problems that impede my ability to do things I should be able to do at my age. This isn't something I see often, and it's one of those things that just had me connecting with the character on a deeper level. I also moved around a lot as a teenager, including to a totally new environment from where I grew up, so I related to a lot of her struggles with being in a new place and leaving all her friends behind. As for the main plot, I fell in love with Bear. It's hard not to sympathise with a wounded and suffering animal. It's hard not to sympathise with everything Darcy did for Bear. Even looking at the things that she did wrong, it's hard to imagine myself reacting all that differently from Darcy. The cast of side characters were interesting and believable. I was in tears by the end. This book explores the life of a young girl and her family who have moved to Yellowstone National Park. Darcy is the main character and she begins the book ill with pneumonia which they later find is altitude sickness. Darcy explores the area surrounding her house on her 1 hour of exercise each day and finds herself in the warm arms of a hibernating bear which later wakes up and becomes reliant on Darcy due to a shoulder injury. Sad ending. - Would have to consider this when using it in the clas This book explores the life of a young girl and her family who have moved to Yellowstone National Park. Darcy is the main character and she begins the book ill with pneumonia which they later find is altitude sickness. Darcy explores the area surrounding her house on her 1 hour of exercise each day and finds herself in the warm arms of a hibernating bear which later wakes up and becomes reliant on Darcy due to a shoulder injury. Sad ending. - Would have to consider this when using it in the classroom but would be a good point for discussion. The book explores family relationships and friendships as well as imagination and unlikely meetings. Children would love this book because it shows them an unlikely friendship and how to set family differences aside to reach an end goal. The book demonstrates strength, determination and courage; all of which are values children need to understand and learn. This middle grade book is about a girl adjusting to a new life in Yellowstone Park. She misses her old life in England, her friends and all the conveniences of modern life. To make things worse, she has been ill and stuck at home ever since arriving. So she hasn't had any chances making new friends. What I like best about this book is the insight into life at high altitude, and what it means when the snow-storm arrives. They say books take you to new places, and this book certainly took me to som This middle grade book is about a girl adjusting to a new life in Yellowstone Park. She misses her old life in England, her friends and all the conveniences of modern life. To make things worse, she has been ill and stuck at home ever since arriving. So she hasn't had any chances making new friends. What I like best about this book is the insight into life at high altitude, and what it means when the snow-storm arrives. They say books take you to new places, and this book certainly took me to somewhere I've never been before. I got a little confused at the start about the POVs, but once I sussed it out I began to enjoy the story. This review has been hidden because it contains spoilers. To view it, click here. An unusual heroine (Darcy, late of London, now in Yellowstone) in an odd, dreamy-breathless situation (pneumonia and winter) has an encounter with a bear. I found the book an easy read, that draws you along through the strangeness of debilitating illness and survival conditions in a national park and connection to the wild. There's a mystery here, too. I'm afraid it does not end well for the bear. Some people like to know that about animal focused books. There's compassion and a deep ecological An unusual heroine (Darcy, late of London, now in Yellowstone) in an odd, dreamy-breathless situation (pneumonia and winter) has an encounter with a bear. I found the book an easy read, that draws you along through the strangeness of debilitating illness and survival conditions in a national park and connection to the wild. There's a mystery here, too. I enjoyed this book. Partly mystical, in the way that Skellig is, this book tells the story of Darcy who has moved to the wilderness with her family because her father is doing research for a year. Darcy is a city girl who absolutely hates the countryside, until she has a close encounter with a hibernating bear. When the bear comes out of hibernation, Darcy faces a tough choice. This is a great book with a very interesting mystical element. Love it! I loved how poetic the descriptions were in this book; the snow-capped mountains and lush green forests were easy to picture. However I spent the majority of my time being bored or confused by what was going on. The multiple perspectives were hard to keep up with and I was constantly flipping back through the book to find out what was going on. 5 stars for writing style, 2 stars for plot and execution. Loved it. Mimi Thebo's story of a girl recovering from illness in Yellowstone NP is extremely current and thought-provoking. At times, some parts seem to 'skip' important details - such as the links with the UK - but I really like the whole focus here on he bear's role in helping the book's protagonist get well - whether it's part of the dream sequence or not. Definitely a book that would appeal to a lot of YA readers, or even younger (and in my case, adults). A simple, elegant, and delicate story of the connection between nature and humans....depicts the rare openness that connects us all. Every sentence, sometimes every word has meaning in this book--it's a beautifully written novel I won't soon forget. Ideal for classrooms 5th-?, especially for those young people interested in the wilderness, in connecting with animals, and in families who live daringly in the icy mountains over winter. 3.5 stars. Another YTF book. I did enjoy this story of Darcy whose family has moved to Yellowstone and she has found it difficult to cope, contracting pneumonia shortly after she arrives. On one of her restorative walks she crawls exhausted into a cave and falls asleep next to an injured, hibernating bear. A bond is formed, one which is both positive and disastrous. A beautifully written story which did have me shedding a tear at the end. I think I expected more nature and stuff instead of this girl wandering off into the snow when even just being outside a little bit would make her sick and potentially dead. Doing it over and over again. Did she curl up with a bear in its den? Who knows. Let's wander out in the snow again. It'll probably be fine. I like the concept of this book, and I did actually find the ending moving. However, I found the writing style annoying and the main character's weakness made her seem irritating and whingey. I didn't like her. I don't really know what the point of the story was either, as the bear didn't even seem to be the main element. I cried my eyes out. The passion and energy of YA is so appealing but the emotion in this one left me exhausted. It was a beautiful connection story and I know I will always remember Bear and her girl Darcy. Note: ARC received via Amazon Vine. Dreaming the Bear is one of those books I wanted to like. I love visiting Yellowstone and exploring that area of the world. I wanted to feel like I was right there in the dangers of the wild with Darcy. Instead I felt like I was reading an emotional, frustrated teenager who was more at odds with herself than with the environment. There are hints of danger and romance. There is a lot of obvious issues with the character's thinking which we see as readers, but sh Note: ARC received via Amazon Vine.